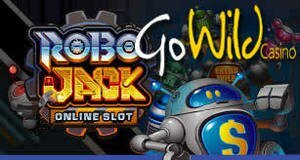 Get in on the action with the new RoboJack video slot with a set of 25 free spins thanks to GoWild Online Casino. Earlier this month, Microgaming announced the release of two new titles. One of those games was RoboJack, a hilarious video slot that gives players a fun game full of action and chances to get big payouts. Players are going to be able to get a set of 25 free spins thanks to a new promotion from GoWild Online Casino. This is essentially a freeroll to help you start your bankroll off with some winnings without having to risk anything of your own. Here's how this promotion works. When you sign up for a new account at GoWild, you'll have 25 free turns for this game added to your account. You play those spins when you want before they expire, and the winnings will be added to your account. Then you can use those winnings to keep playing RoboJack or to play tons of other games that they have available. This is an awesome way to get a look at this new game to see if you like it while also giving yourself a free opportunity to pick up some winnings. RoboJack is a game that follows some of the trends of new games while breaking away from the norm in other areas. On one hand, it uses the popular 243-ways format that gives you a way to get paid by picking a single symbol from each reel in any combination. On the other hand, it uses five different robot characters to create a setup for five different bonus features with extra additions to free spins bonus rounds to give you even more value. This isn't something you see that often, and it adds a lot of excitement to the game. When it comes to GoWild, they are a great place to get value in general because of the cool promos they offer on a regular basis. This set of 25 free spins is just one example of what kind of deals they give players. Thanks to the Microgaming software package that they use, they are able to offer up hundreds of top games, and since they give you great ways to get paid while enjoying this selection, it's a winning combination for any kind of player.